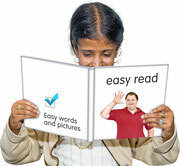 We can have a group of adults with learning disabilities who can check your easy read make sure it is clear. We can make CD's and DVD's of your information as well. You can consult us on making your website more accessible. Email us for a quote.